She went for a bike ride with me recently. Weird, huh? She made me a sandwich for lunch and after eating I asked if she’d like to ride the bike around the 3-mile loop with me. She said she would. So I pumped up the tires on the black ballon tire cruiser and she pushed it up to the road. It was a little hot and windy. Not long after starting (like a quarter mile) she began telling me that her legs were tired and not to take her picture. But you all know that “no picture” is not an option. Since it is critical to illustrate blog entries, I got a picture that makes her look like she’s having fun and going fast. 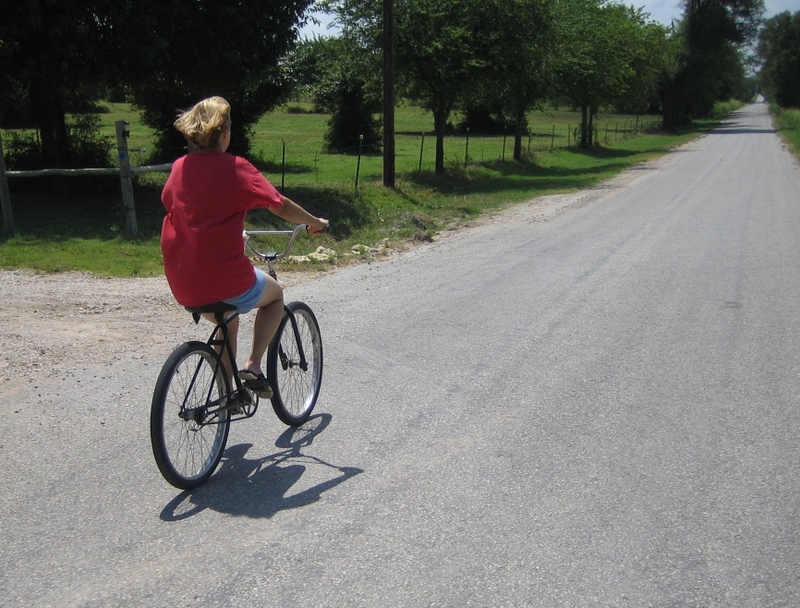 She was cruising down an empty road, wind in her hair, on a beautiful summer day. How could you not be having fun?